Home > Products > 1821 Carta de S. Domingo, Guista quella de Poirson. 1821 Carta de S. Domingo, Guista quella de Poirson. 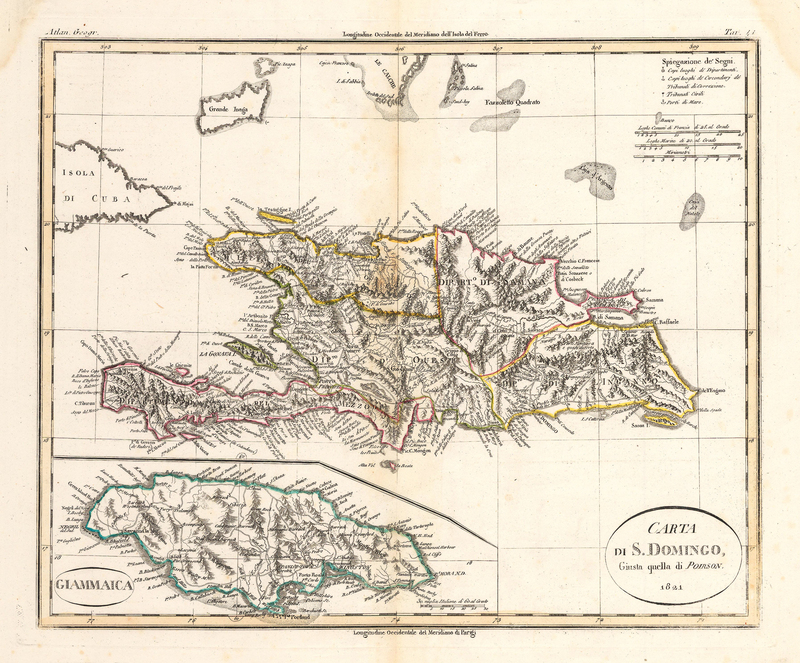 This colored example of Rossi’s map depicts the island of San Domingo (Hispaniola) in the Caribbean Island group known as the Greater Antilles. The second largest island in the Caribbean after Cuba, it is divided between two sovereign nations, the Spanish speaking Dominican Republic, and the Creole speaking Haiti. An inset map depicts Jamaica. The map is highly detailed with settlements of all sizes noted and named, including cities, towns, villages and large encampments. All ports are rendered and named, and the rugged mountainous terrain beautifully depicted. Nearby islands, including the eastern end of Cuba are included, as are features of interesting to seagoing vessels, such as shoals. An equally detailed inset map of Jamaica fills the lower left quadrant, also with shallows and shoals depicted. Hispaniola is the site of the oldest continually inhabited European settlement in the Americas, founded by Christopher Columbus during his voyages in 1492-93. When he took possession of the island in 1492, he named it Insula Hispana in Latin and La Isla Española in Spanish, both meaning "the Spanish island". Though the island continued to be called Hispaniola, and alternatively San Domingo (under French rule) till 1802, Bartolome de las Casas, the Dominican missionary, historian and defender of the rights of indigenous peoples had called the entire island Haiti in the late 15th and early 16th centuries, based on the labeling of the mountainous region as ‘Haiti Mountains’ taken from the indigenous peoples’ name for it. Spanish court historian Pietro Martire d’Anghiera of the same era noted the change of names, stating that the name of one region had been given to the entire island. But it was not until the island declared its independence in 1802, that the island was officially renamed as Haiti. Condition: This hand colored map is in B+ condition with some water staining in the edges of the upper corners. The centerfold has been reinforced with archival material on the verso.